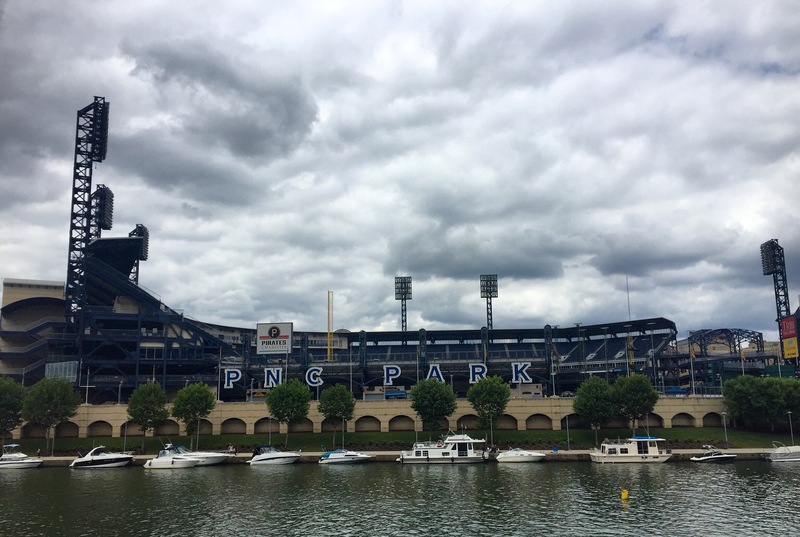 Shown above is a view of PNC Park, the home of the Pittsburgh Pirates, from the Allegheny River. The Pirates are facing backlash from some fans after the team traded outfielder Andrew McCutchen to the San Francisco Giants in January. Photo by P.Parise/Setonian. The Steel City of Pittsburgh is known for its many bridges and various restaurants, but one thing the city prides itself on is its three professional sports teams. The Pittsburgh Penguins and the Steelers have had their fair share of victories over the year, while the Pirates were not as successful as fans were hoping. The past year has been a difficult time for the city. Pittsburgh has lost several key players from each team, including players who have made their mark in the town. Following their fifth overall and second consecutive championship, the Penguins had to say their goodbyes to faces all too familiar to natives of the Pittsburgh area. Following the 2017 championship, franchise goaltender Marc-Andre Fleury was chosen by the league’s newest team, the Las Vegas Golden Knights, during the expansion draft. After hoisting the Stanley Cup once again, the Penguins had five players pending in free agency last summer: Chris Kunitz (forward), Nick Bonino (center), Trevor Daley (defenseman), Ron Hainsey (defenseman) and Justin Schultz (defenseman). Schultz was the only one to re-sign with a $16.5 million, three-year deal. Forward Matt Cullen was also in the mash of players who left the success behind in free agency. Cullen signed a one-year, $1 million deal with the Minnesota Wild. The Penguins’ biggest stars, Evgeni Malkin, Sidney Crosby and Phil Kessel, are now relying on the team’s young rising stars, Jake Guentzel, Conor Sheary, Bryan Rust and Dominik Simon, in hopes for a three-peat Stanley Cup victory. The Penguins stand at 30-22-3 currently in the season and are second in the Metropolitan Division behind the Washington Capitals. Pittsburgh sports have seen more changes than just hockey. Following the season loss Dec. 17 to the New England Patriots by a score of 27-24, the Pittsburgh Steelers, who went 13-3 in 2017, released linebacker James Harrison. Harrison was named Defensive Player of the Year in 2008 and also made an appearance in five consecutive Pro Bowls from 2007-2011. Over the past two seasons, injuries have yielded the Steelers linebacker, causing him to miss eight out of 32 games in 2016-2017. The move may have also been motivated by Harrison’s $3.5 million, two-year deal back in March of 2017. Harrison is currently signed with the New England Patriots for a one-year, $1 million deal. Harrison, 39, is the second oldest player for the Patriots and was recently defeated by the Philadelphia Eagles 41-33 in Super Bowl LII. In January, Steelers’ offensive coordinator Todd Haley also announced he was leaving the team. Haley has been the O.C. of the Steelers for the last five years and signed with the Cleveland Browns. Aside from the Steelers and the Penguins, Pittsburgh’s baseball team, the Pirates, also had to say goodbye to influential players. On Jan. 13, the Pirates made a deal with the Houston Astros and traded pitcher Gerrit Cole in return for a package of prospects. Days later, following the Cole deal, Pirates traded outfielder Andrew McCutchen to the San Francisco Giants in exchange for minor league players Kyle Crick (pitcher) and Bryan Reynolds (outfielder). Cole and McCutchen have both made their mark within the city, with McCutchen being as big a symbol as the pierogi race that takes place during Bucco games. A petition has recently been in the bouts, with over 60,000 signatures of Pirates fans who want the owner of the Pirates, Bob Nutting, to sell the team. The success of the petition going through would mean a new owner of the Bucs and the hopeful rebuilding of a team that has success throughout future years. The city may be disappointed in the faces that have left the ‘Burgh, but with new players and talents, the chances of future success are at a tight grit. Business is business in sports, and the new players will have to adapt to their new teams with hopes of continuing Pittsburgh’s success and rebuilding.